Just as cilia lining the lungs help keep passages clear by moving particles along the tips of the tiny hair-structures, man-made miniscule bristles known as nano-brushes can help reduce friction along surfaces at the molecular level, among other things. Like microscopic orchard keepers, the Duke scientists have grafted bundles of polymer “limbs” on flat surfaces known as substrates, already covered with brush bristles. 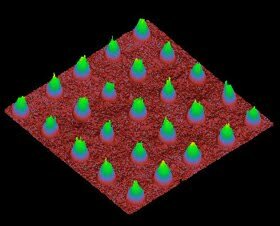 In their approach, two dissimilar brushes can be joined and patterned on the micro-scale. Because the “limbs” can be made out of a different substance than the substrate, the scientists believe these nano-structures are able to significantly modify the properties of a given surface. To make such a nano-brush, scientists add a chemical known as an initiator to the flat surface, which spurs the growth of the strands. “One of the common ways of growing brushes is much like a dot matrix printer, with an initiator being the ink ‘printed’ onto an inorganic substrate, such as a silicon wafer or a gold surface, which then causes the brush bristles to grow in specified patterns,” said Stefan Zauscher, Alfred M. Hunt Faculty Scholar and associate professor of mechanical engineering and materials science at Duke’s Pratt School of Engineering. The results of his team’s experiments were published online in the journal Small. The research is supported by the National Science Foundation. Zauscher said this new approach could be readily expanded to many other types of polymers, and to make either single or double layers of brushes. These nano-brushes, he said, would have many potential uses, and would open up the possibilities for building more complicated polymer architectures, which are much in demand for current and future technologies. In recent research, published earlier in the journal Advanced Materials, Zauscher showed that stimulus-responsive nano-brushes resemble and act like sea anemones, which have a multitude of arms reaching up from an attached base. In the same fashion as these sea animals, nano-brushes can be used to capture and release micro-particles as they move across a surface. “These microstructures have a potential use in microfluidic systems -- such as labs-on-a-chip -- to capture and release particles at predefined locations, much like the sea anemones capture their prey and guide it to their mouths,” Zauscher said. Other Duke members of the team are Tao Chen and Debby Chang.